How do I invite subcontractors to contribute to my project? You can invite your subcontractors to contribute documentation to your Daily Reports. 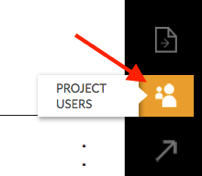 Only project administrators have the ability to invite contributors to a report. Click on ‘PROJECT USERS’ on the vertical toolbar towards the right of the page. 3. Click on ‘Invite Contributors’. 4. Type the email address of the contributor in the text box and click ‘Invite’.